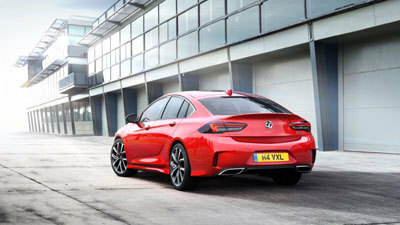 With its debut set for the 2017 Frankfurt Motor Show, Vauxhall has released first pics of the all-new Insignia GSi, which will deliver high levels of performance through all-wheel drive, a new chassis and Brembo brakes, and will be powered by a refined 2.0-litre turbo petrol engine. The performance variant of Vauxhall’s latest flagship model has an eight-speed automatic gearbox, which can be operated via a paddle-shift on the steering wheel to provide a more active and responsive driving experience. Staying true to the latest-generation Insignia range, the GSi combines lightweight design and a low centre of gravity with turbocharged power. These factors result in excellent balance and a favourable power-to-weight ratio. Exterior design updates include chrome air intakes at the front and a rear spoiler for the required levels of downforce, while on the inside the full-leather sports seats, a leather sports steering wheel and aluminium pedals add the finishing touches. The GSi’s chassis has been fine-tuned to create the most poised and composed yet, taking the already fine dynamics of the regular Insignia Grand Sport to another level. The benefits of these chassis developments are not just in the improved driving experience though, with the GSi proving to be faster than its predecessor on the track too. Having undertaken parts of its development on the iconic Nürburgring circuit, the GSi is 160kg lighter than the comparable Insignia, which, when combined with the low centre of gravity, creates more traction and leads to faster times on the race track. Vauxhall has developed an all-new chassis for the GSi, supported by shorter springs that lower the model by 10mm, while specially developed sports shock absorbers reduce body movement significantly. Powerful Brembo four-pot calliper front brakes have been incorporated to work in conjunction with the Insignia GSi’s mechatronic FlexRide chassis, which adapts the suspension and steering instantly. The chassis control unit also changes the calibration of the accelerator pedal and the shift points of the eight-speed transmission to refine the steering and throttle response to suit the situation. Drivers can choose from three key driving modes, Standard, Tour and Sport, while Vauxhall has also developed a fourth setting exclusively for the Insignia GSi, ‘Competition’. With a double press of the ESP button, the GSi switches the traction control off and allows more yaw, giving skilled drivers the chance to realise the car’s full potential. Excellent handling is guaranteed thanks to the sports chassis, Michelin Pilot Sport 4 S tyres and 18-inch wheels (20-inch wheels available), delivering exceptional levels of grip to make the GSi more responsive. That is supported by all-wheel drive with torque vectoring, which replaces the conventional differential on the rear axle with two clutches to accelerate each rear wheel individually as required by the driving situation. This ultimately prevents understeer. The Insignia GSi is powered by a 2.0 litre turbo petrol engine, producing 260PS and generating 400Nm of torque (NEDC fuel consumption: 25.2mpg urban, 39.7mpg extra-urban, 32.8mpg combined, and 197g/km CO2). The four-cylinder unit is mated to an all-new eight-speed automatic transmission, and the driver can manually determine the shift points of the system in Standard and Sport modes to suit their personal driving style. The sporty performance of the Insignia GSi is matched by new design features, technology highlights and exclusive accessories inside and out. On the inside, new AGR-certified sports seats developed by Vauxhall provide increased lateral support and long-distance comfort. Similar to those found in the Insignia Grand Sport, the premium seats offer ventilation, heating, massage and adjustable side bolsters. Customers can specify the seats in one of two leather combinations, each featuring the prominent GSi emblem. The interior strikes the perfect balance between comfort and performance, featuring a leather steering wheel with a flattened lower, aluminium pedals and a stylish black headlining. The GSi logo can also be seen at the rear of the car, which carries a spoiler to deliver additional levels of downforce to the rear axle. The rear also features two chrome-edged exhaust pipes, and chrome air intakes can be found near the front wheels to assist the vehicle’s performance further.